A HUMAN PERSPECTIVE In April 2000 in Zimbabwe, armed men attacked the farmhouse of a white farmer whose family has lived in Zimbabwe for generations. A political crisis that goes back to Britain’s colonial rule caught white farmers in a violent crossfire. British colonial rule ended in 1980, but more than 4,000 white farmers in Zimbabwe still own one-third of the best land in a country of about 10 million blacks. The British and the white farmers have made attempts to equalize land ownership, but Zimbabwe’s leaders have not taken advantage of these opportunities. Instead, they have targeted individual white farmers who own that land. This conflict illustrates a critical issue in all of Southern Africa—that blacks far outnumber whites but still own little of the land. Southern Africa includes Angola, Botswana, Comoros, Lesotho, Madagascar, Malawi, Mauritius, Mozambique, Namibia, South Africa, Swaziland, Zambia, and Zimbabwe. The history of Southern Africa involves a blending of colonialism with African cultures and the development of gold-trading empires. The majority of the people in Southern Africa are Bantu-speaking peoples, including the Shona people. Around 1000, the Shona established a city called Great Zimbabwe in what is now the country of Zimbabwe. From the 1200s to the 1400s, Great Zimbabwe became the capital of a thriving gold-trading area. But for unknown reasons, around 1450 the Shona abandoned Great Zimbabwe. One theory is that cattle grazing had exhausted the nearby grasslands, and overfarming had ruined the soil. According to local legend, a man named Mutota left Great Zimbabwe around 1440 and settled in a fertile valley to the north. He founded a new state to replace Great Zimbabwe. By the time Mutota died, the Mutapa Empire extended throughout all of present-day Zimbabwe except the eastern part. The Mutapa Empire thrived on the gold trade. In the 1500s, however, the Portuguese arrived and began interfering with the politics there. Soon, the Mutapa Empire began to decline. This event showed the increasing role Europeans would play in Southern Africa. As Europeans migrated to Southern Africa in the 1700s and 1800s, their presence led to conflicts with Africans. 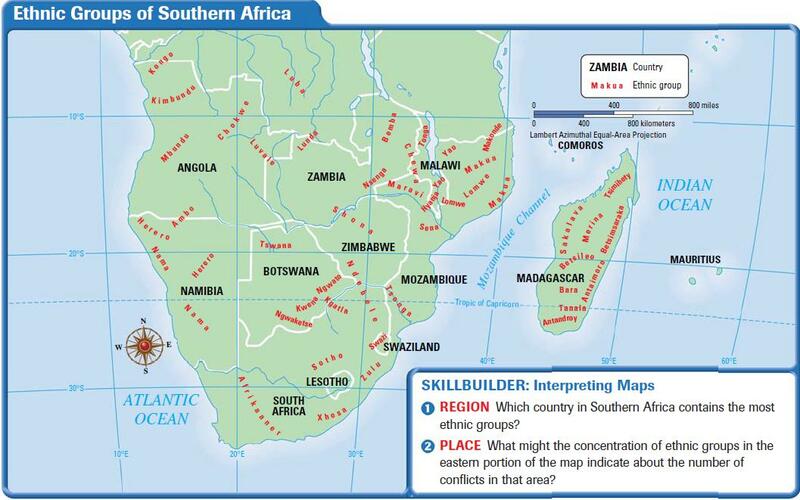 As the map below shows, many different ethnic groups were already living in Southern Africa. They competed with each other and with the Europeans for control of the land. In the early 19th century, the Zulu controlled a large area in Southern Africa. However, the British defeated the Zulu and by the late 19th century had taken over their land. In the 1890s, the British battled the Dutch farmers, or Boers, in the Boer War for control of the region. The Boers had arrived in Southern Africa in the mid-1600s. The British won the war and formed the Union of South Africa in 1902. South Africa is currently a country in the region of Southern Africa. In 1948, the white minority government of South Africa instituted a policy of apartheid, or complete separation of the races. It banned social contact between blacks and whites and established segregated schools, hospitals, and neighborhoods. Although blacks made up 75 percent of the population, they received only a small percentage of the land. The government kept the best land for whites. In 1912, blacks had founded the African National Congress (ANC) to fight for their rights. In 1949, Nelson Mandela emerged as one of the leaders of the ANC, and he led a long struggle to end apartheid that resulted in his being imprisoned. By the 1980s, nations around the world—including the United States—pressured South Africa to end apartheid. In 1989, F. W. de Klerk became the president, and he wanted to change South Africa. As a result, South Africa experienced a peaceful revolution, and the government ended its apartheid laws. An election that involved members of all races in South Africa took place in 1994. Mandela, having been released from prison, won the election and became president. In 1996, the government passed a new, democratic constitution that guarantees the rights of all citizens. The economies of Southern African countries are some of the most advanced in Africa. However, many countries are struggling to raise the standard of living for blacks, who get the worst jobs, own the least productive land, and attend the worst schools. The policy of apartheid has hurt the economy of South Africa. Because of apartheid, foreign nations imposed economic sanctions that prevented their countries from conducting business with or investing in South Africa. In addition, the policy led to poor education of blacks, creating an uneducated mass of young people. As a result, two economies exist in South Africa. One segment of South Africa has an upper-middleincome economy like that of the United States. South Africa possesses great cities with huge industrial complexes, such as Johannesburg and Cape Town. It also has modern, mechanized farms and large ranches. In contrast, though, South Africa also has p0verty-stricken rural areas. Black townships and shantytowns also fill portions of the cities. Furthermore, the government currently faces problems arising from unequal land distribution and a severe housing shortage. Botswana illustrates a problem that exists in many African countries today. It made a great deal of money from valuable resources but has serious agricultural problems and an unequal distribution of wealth. Botswana gained its independence from Britain in 1966 and subsequently experienced long-term economic growth. In 1966, its per capita income stood at $69. In 1997, that figure had risen to $3,900 per capita. Botswana’s wealth is based on minerals. People discovered diamonds there shortly after the country’s independence from Britain. By 1995, Botswana had become the world’s third largest diamond producer. Diamonds account for more than 63 percent of government revenue. A problem, however, is the uneven distribution of the profits—an issue in many African countries. Approximately 80 percent of the people work as farmers and never benefit from the diamond revenue. The other 20 percent grow wealthy from diamond money. One problem developing from this unequal distribution is that wealthy people are purchasing large tracts of land for cattle ranching from poor farm owners. As a result, poor farmers often move to less productive land. Meat production then increases, but overall food production actually decreases. The country winds up producing only 50 percent of the food needed to feed its population. The rest must be imported or come from international aid. By 1999, the most severe AIDSaffected countries were in Southern Africa. In Zimbabwe and Botswana, for example, more than 25 percent of all adults were infected with HIV, the virus that causes AIDS. In Botswana, the life expectancy was 60 years old in 1994 but had declined to 39 years of age in 1999. The disease also has far-ranging implications for any country’s economic well-being. In Botswana, many highly trained diamond sorters have died from the disease. Southern Africa is a rich mosaic of cultures and traditions. More than any other region, it is a mix of African and European cultures. Celebrations and festivals are a large part of life in Southern Africa. The Chewa people perform a dance called the gule wa mkulu, which reflects their traditional religious beliefs. Dancers dress in ragged costumes of cloth and animal skins. They wear masks and sometimes walk on stilts. The Tumbuka people in northern Malawi perform the vimbuza, a dance performed by healers who wish to cure people of sickness. Other dances include the benji dance of the Yao people in southern Malawi. This dance, performed by Yao warriors, pokes fun at what these warriors saw as the desire of the European militaries to march and have parades. In Madagascar, during the hira gasy festival, costumed groups of 25 or more people play music, perform dances, and act out stories. The themes are upbeat and praise the virtues of honesty and respect for elders. Johannesburg, South Africa, is one of Southern Africa’s largest cities and offers its residents a variety of opportunities and experiences. About 100 years ago, Johannesburg began as a small mining town and grew because of nearby gold reserves. Today, greater Johannesburg is a city of more than six million people with many different ethnicities and lifestyles. The center of Johannesburg looks like most modern big cities, with a cluster of skyscrapers dotting the skyline. However, as a result of apartheid, greater Johannesburg developed into two different cities. To the north lie the spacious suburbs that were once exclusively white. To the south are poor black townships. Some Southern Africans live a modern lifestyle as doctors, lawyers, and businesspeople. These people live in tree-lined suburbs that look no different from those found in the United States. Many blacks, on the other hand, because of apartheid’s legacy, still work in menial and unskilled jobs. They still live in the former black-only homelands and shantytowns. Some ethnic groups of Southern Africa follow more traditional patterns as farmers, traders, or herders. For example, the Zulu either work in menial jobs, such as mining, or cling to their traditional roles as farmers and metalworkers. The Zulu have a long tradition of making hoes, spears, axes, and other tools and weapons.